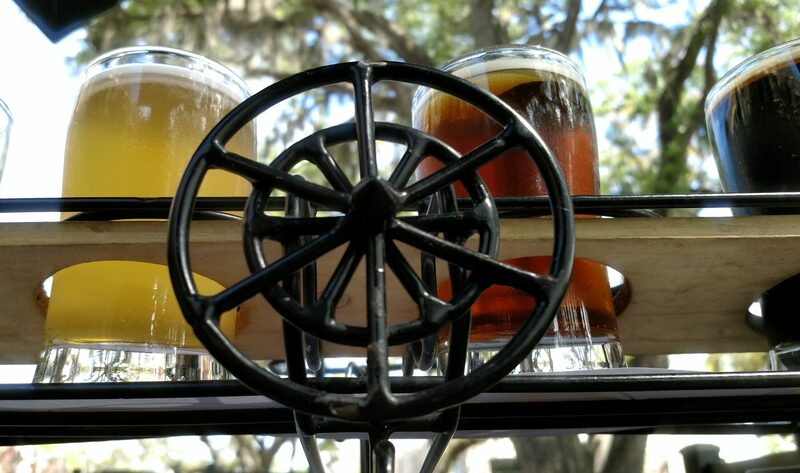 Switching back to some vacation brews, my wife and I met some locals while bar-hopping and exploring antique shops in Deland one afternoon and they strongly recommended we spend the end of our “date night” dining at Mount Dora Brewing. 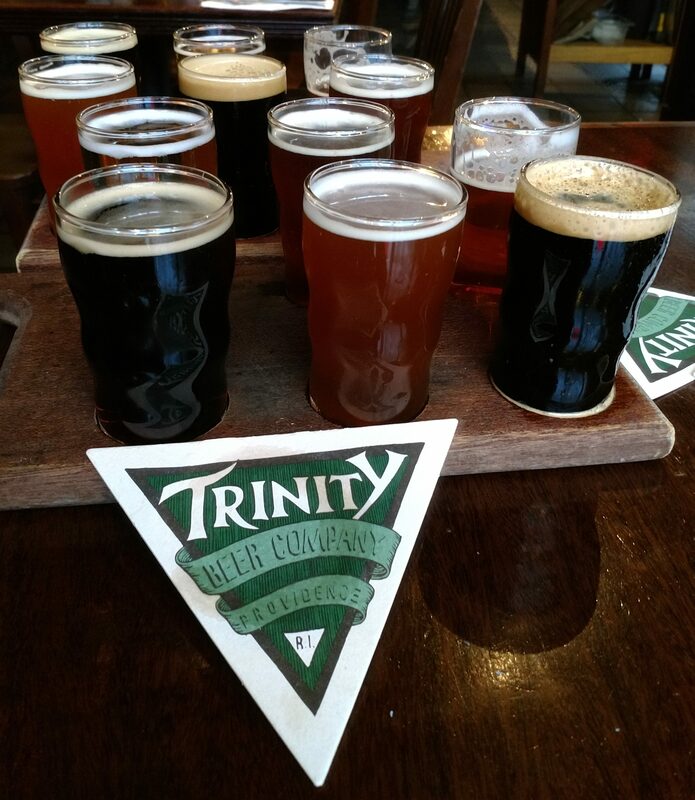 I had been aware of this place for a few years now, but for a variety of reasons we never made it in; perhaps most notably on account of a lack of interest in beer on my wife’s part and some less than stellar reviews I’d come across on Beer Advocate. These people seemed to know what they were talking about, though, so we decided to check it out. Well, let me start by saying that we made quite the mistake not visiting this place during the last few years as my wife and I had a fantastic time! From the moment one walks in the door they can just tell there’s a lot of character here. You enter into a modestly sized dining area with a bar to the left and a small stage for live music in the back where there was a cover band playing classic rock. The decor was eclectic to the extreme, with lots of repurposed materials employed throughout and old brass instruments hanging from the ceiling amidst the lights. Upon seeing the place it was no surprise at all that folks working at an antique place packed with old furnishings would love it here. We chose to avoid the crowd in the main room, however, and instead opted for the outdoor seating in the back which for all intents and purposes felt like eating a leisurely meal in their backyard. 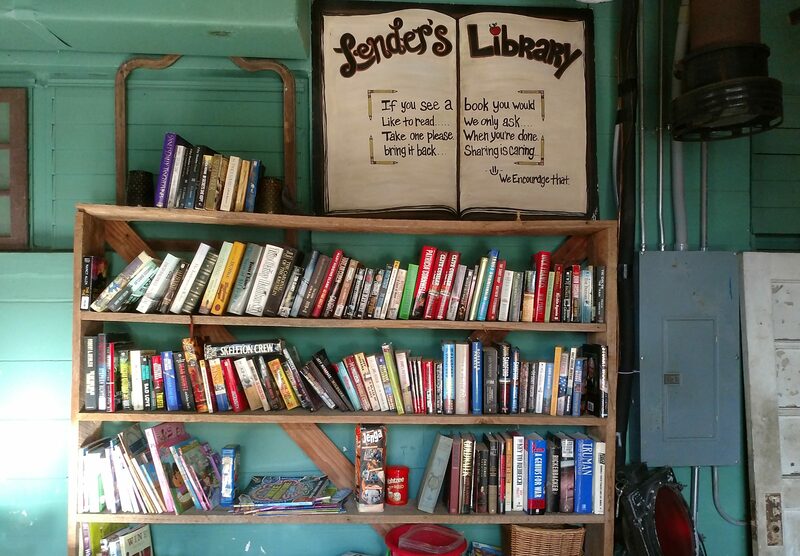 To get there we passed both the stage and another, much smaller, indoor seating area complete with a bookshelf full of books to swap, borrow, or take. Before getting into the beer, I also want to be thorough and give a few quick thoughts on the food. My wife and I split an order of the pretzel and beer cheese appetizer and it most definitely did not disappoint. As for our entrees, both her shrimp pesto dish and my chicken breast with brie cheese and bacon were quite impressive as well. So far, delicious! As an additional FYI, if anyone in the party is not interested in beer they also serve wine and cocktails, which seemed to be pretty well received by those around us as well. Now that I’ve set the rest of the scene, let’s talk beer. The selection here was a bit different than most taprooms I’ve been to in that they offered one limited release, three malt-forward core beers, and another three offerings that were blends of the core offerings. Notably absent was the presence of any sort of IPA (the one they brew was kicked for the day) or other hop-centric brew which is pretty rare these days. As is my tendency when visiting new places, I ordered the six beer flight with an additional pour of the seventh, and final beer, on tap added on for good measure. The late addition was their Blueberry Beer, a light fruited sour brewed with blueberries sourced from a farm in nearby Eustis. Tart and refreshing, it also featured plenty of sweet blueberries and really showcased what the style is about. It was a great beer for drinking outside with food. As for the core offerings, I sampled the Beauclair Blonde Ale, Rockin’ Rabbit Red Ale, and Pistolville Porter. Going in that order, the 7.0% blonde ale had a thick, creamy pale malt opening and finished with a brown sugar sweetness. It certainly wasn’t the light, bubbly blonde ale I’d come to expect at this point in the trip, but it was pretty tasty regardless. Up next was 8.0% red ale offered a lightly toasted malt base beneath a nice smooth sweetness from the orange blossom honey it was brewed with that also gave it pleasingly smooth, thick mouthfeel. Rounding out this part of the flight, the porter was decidedly my favorite of the group. Checking in at a robust 9.9%, it offered plenty of rich malts backed up by notes of caramel and chocolate. After getting acquainted with these three brews, I moved on to the blended ales. The Dora Drawdy Drool was a blend of the red and blonde ales that offered up a pleasing, malty sweetness blending the pale malts of the Beauclair Blonde and rich honey presence of the Rockin’ Red. The Dirty Blonde mixed the porter and the blonde ale, lightening up the former a bit with the pale maltiness of the latter. Finally, the somewhat unfortunately named Rabbit Pellet Porter combined the red ale and, well, the porter. This was my favorite of the blends as the honey from the red ale joined quite nicely with the bold flavors of the porter, giving a bit of extra flavor and body. While enjoyable on the whole, I do think that I preferred the stand-alone offerings and found that they didn’t sit quite as heavily on the palate (a definite factor to consider while drinking with food in warm weather). That said, I would advise anyone in the area looking for a good spot for food and drinks to give this place a visit. The atmosphere was a great mix of fun or relaxing depending upon what you were looking for, the food was excellent and, despite the lack of flashy hop-forward options, the beer was good as well. I feel like we missed out skipping this place the past few years, so for sure we’re coming back again next time we come down! One of the really fun things about our trip last week was that we did a bit more exploration than usual and tried out a lot of things we hadn’t done on previous visits. For one of our first new adventures we drove about a half hour south of our home base in Sorrento to the city of Winter Garden. 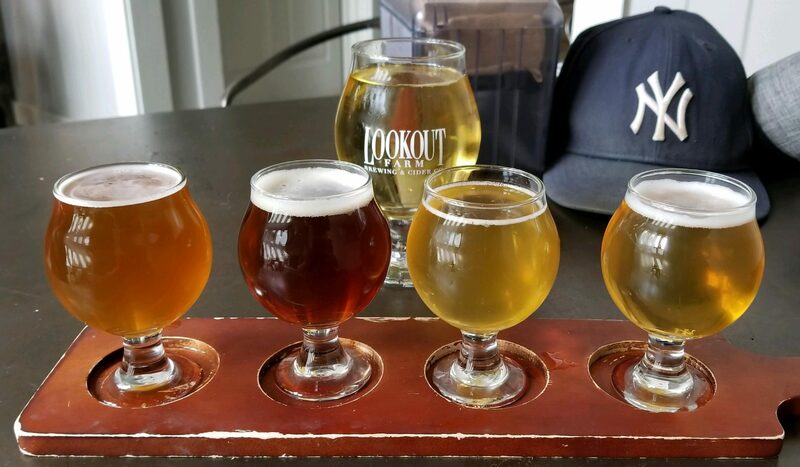 Lured by the discovery of a new (to me) brewery called Crooked Can, we decided that it looked like a good place to grab lunch and a few drinks. Crooked Can’s brewery and taproom is located downtown at the end of a small market place it shares with several artisanal food stands and shops. Everything we passed by looked amazing, especially the cuts of meat at the butcher stand, but most of our food for the day came from Morthan Cheese. Honestly, I don’t think I can say enough good things about that place. The food was absolutely delicious, we each had roast beef sandwiches and shared a surprisingly large order of pretzel bites topped with their mild cheese melt, and the man behind the counter was incredibly friendly, offering samples and even bringing the food to our table while we sat outside! The food and service were both top and I’d highly recommend giving them a try if you’re in town. If cheese doesn’t happen to be your thing, there was a pretty diverse range of options available at the other stands so I would image almost anyone could find something they’d like. Beer, however, was my main focus of the day. As I mentioned above, the brewery was located at one end of the market and took up maybe a quarter of the building that housed the market. There was some indoor seating available in the taproom itself, though considering the nice weather there was no way we weren’t going to take advantage of the market’s ample outdoor seating. Decorating the taproom was a large electronic screen listing the day’s tap list and several posters of the brewery’s label art featuring silhouettes of a steampunkish Victorian-era man engaging in various shenanigans. It seems like such a little thing in retrospect, but that art was indeed it a big part of the reason we chose to visit Crooked Can over a couple of other options in the area. 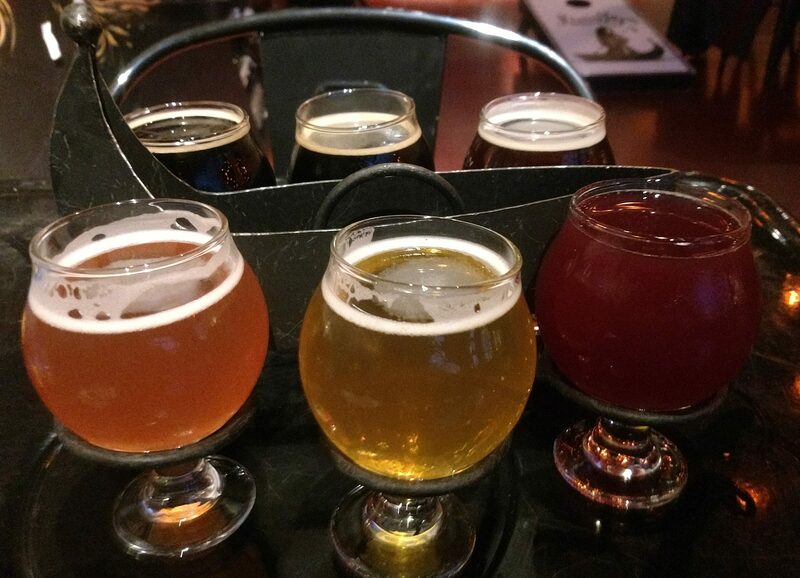 There were more than a dozen beers in a variety of styles on tap that day, so my wife and I decided to divide and conquer by each ordering a flight of our own to get as much of a feel for the place as possible. Our original plan was to try everything, but by the time we finished lunch my father-in-law and son were both ready to head over to our next stop so we packed up and moved on. I do feel like I have unfinished business there now, but at least it gives us a good reason to go back! Our flights were served in iron airplanes that, in addition to being really cool looking, complimented the overall aesthetic of their can art quite nicely. While we liked to loved everything we tried, rather than run through the whole list of our samples I’m only going to touch on our top three. 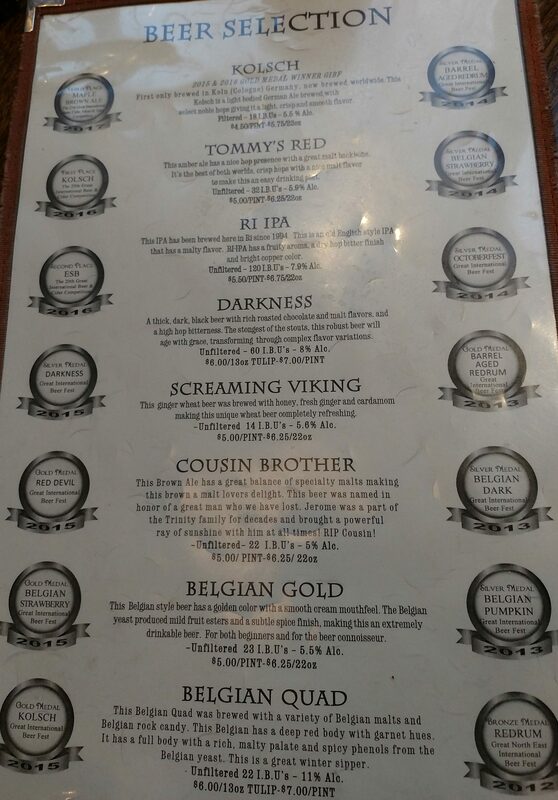 The consensus favorite was (appropriately enough) a Golden Belgian Strong Ale named Domestic Bliss. Checking in at 9.5%, it tasted a lot lighter than its ABV would suggest and offered all the glorious bubblegum yeast, banana esters, and mild peppery notes you want from the style. My personal highlight was Freedom Ride, a creamy 5.0% milk stout that had just the right amount of mild roast on the end. It was the only stout on the list that day and it did not disappoint! My wife on the other hand was a huge fan of a 5.5% red ale named Tri-Wishes. Since she was pretty attached to her sample, I’ll rely on her word that its smooth, sweet malts and light grains made for a highly enjoyable drinking experience. Lastly, because we enjoyed this place so much, I’ll also give an honorable mention to King of Shoals, a 5.6% IPA with a clean, light bitterness and nice lime/citrus notes. It was a nice, light flavorful that was great to drink outside. Between the wide variety of great beer, wealth of delicious food options, and relaxed outdoor seating we all had an amazing time here and are highly likely to come back again the next time we go down to Florida. This was a fantastic all-round experience and I highly recommend stopping by the market for food and some beer if you happen to be in the area! Located about an hour west of BeerRantsandBooks headquarters, River Styx Brewing opened up a little over a year ago in summer 2017. With Halloween now in the air and a pressing need to break up a long car ride, the family and I made a stop here the weekend before last on the way home from visiting some friends so ifinaI fi had a chance to check this place out. The first thing I noticed upon our arrival was that the brewery’s aesthetics were cool as, um, hell. Visitors are directed to the front doors by the sign of Charon above, beckoning thirsty travellers to step inside. The doors open up to reveal a large open space (think function hall) with a number of small black tables spread about. This part of the brewery was dark (at least in the evening) and lit almost exclusively by a sea of small hanging lanterns that gave off a flickering effect. Adding to the scene were walls covered with artwork and murals inspired by the mythical river. The bar area was in the back right of the building and was more traditionally lit. It had a decent number of stools for those who like to stay close to the taps and a small TV unobtrusively tuned into the featured sportsball broadcast of the day. The music was a touch on the loud side, but otherwise a thoroughly enjoyable mix of classic and late-90s radio rock with a little bit of Coolio thrown in for good measure. 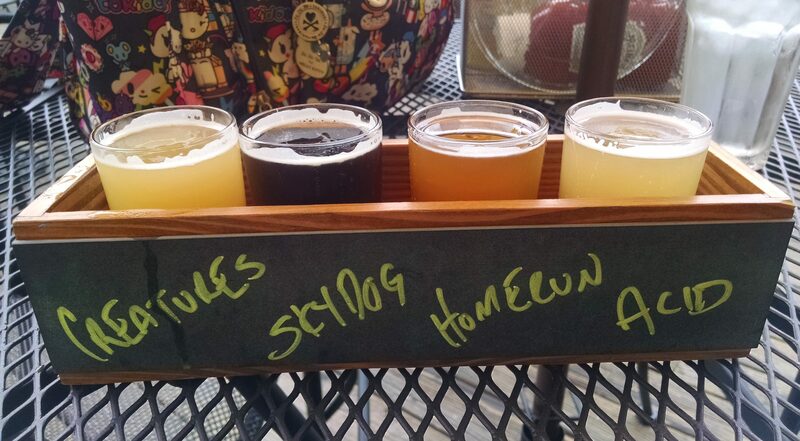 One of the biggest draws for us in visiting, however, was the brewery’s policy of explicitly welcoming families (read kids) and well-behaved dogs. People definitely seemed to take advantage of this and my son had himself a great time playing with some giant wooden blocks and oversized checkers with another toddler that happened to be there. It’s at this point that I need to give another shout-out to my amazing (and non-beer drinking) wife for not only supporting this crazy hobby of mine, but for also keeping an eye on playtime while I took notes for this post. To make the most of my visit, I ordered a flight of 6 samples. It cost $15 and was served in a nifty little iron boat carrier that really added to the ambiance. There was a pretty good mix of styles available, so I tried to mix it up as best I could while hitting some of personal interest as well. I started off on the lighter end of things with Nectar of Aristaeus – Blueberry Glazed Donut, a 6.0% “milkshake-style” IPA brewed with blueberries, lactose, and vanilla beans that in the dark lighting had a bloody looking deep reddish-purple body. It had a light, juicy taste with an edge of tart blueberries and creaminess that flowed into a mild mix of earthy hops and malt on the finish that made a strong first impression. Up next was Helios the Sun God, a 5.3% Farmhouse Ale conditioned with peaches that poured to a clear, golden body. It had a refreshing, lightly funky and peppery taste highlighted by peach notes that peaked upon the brew’s bubbly finish. Rounding out the first half of my flight was another 5.3% offering, this one a Sour Ale named Dawn of Hyperion. It had a glowing amber body and a taste that featured tart strawberries with a lemon rind sourness atop a roasty tasting malt base. I was not a fan of this one and am going to call it a miss for me. At this point I switched over to the other side of the boat where the bigger beers were lurking. First up was HOP, a cask conditioned West Coast-style double IPA brewed with pomegranate. Checking in at 9.0%, it poured a deep reddish-brown body and had a very nice base of both caramel and ever-so-slightly toasted malts underneath an aggressively dank and resinous haze of piney hops. It finished with a lingering blend of caramel malt, raw brown sugar, and hop resin that put this in the running for my favorite beer of the flight. In close contention, however, was the next beer named Ares God of War. A big, bold 12% imperial stout it brought on huge notes of chocolate, coffee, and vanilla. My nitpick is that I wish it had a slightly thicker body, but on the whole I was pretty impressed with this one as well. The final sample of the day was an 11.0% port barrel aged imperial stout named Rhea Darkness. Super smooth with a big, creamy dark malt profile I was amazed at how easy drinking this was for such a large beer. Put all that together and I am happy to report that my visit here was a success and good time was had by all! 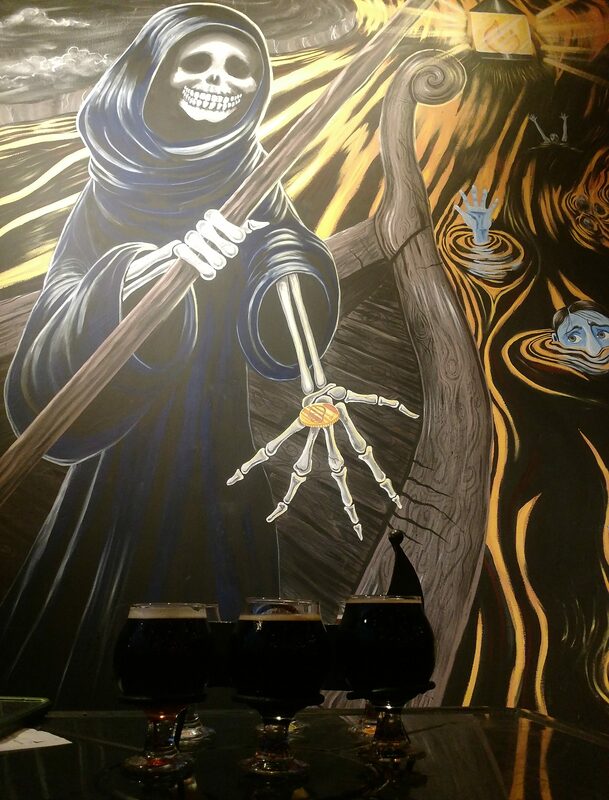 The novelty of the really cool decor and mythological themes were backed up by some good beer, making this a place I am definitely interested in revisiting this winter, especially since it was so welcoming to everyone in my crew. Definitely check this place out if you get a chance. Just a short train ride away from home and right down the street from my old haunts at Night Shift, is the site of Bone Up Brewing Company‘s taproom. I’ve been meaning to check out this place ever since it opened up back in August 2016, but for a variety of reasons I never got around to it. Luckily for me that finally changed this past weekend. Bone Up is located in a modestly sized industrial building it shares with a CrossFit gym and a small restaurant. The taproom is pretty cozy, especially in comparison to some of the others in the area, but they make good use of the space and have given it quite a lot of character. Staring into the room, there is a bar counter to the right, a line of seven or so tables with chalkboard tops down the center of the room, and a small patio out front with a few extra seats. The wall on the left side of the room is pure nostalgic gold. 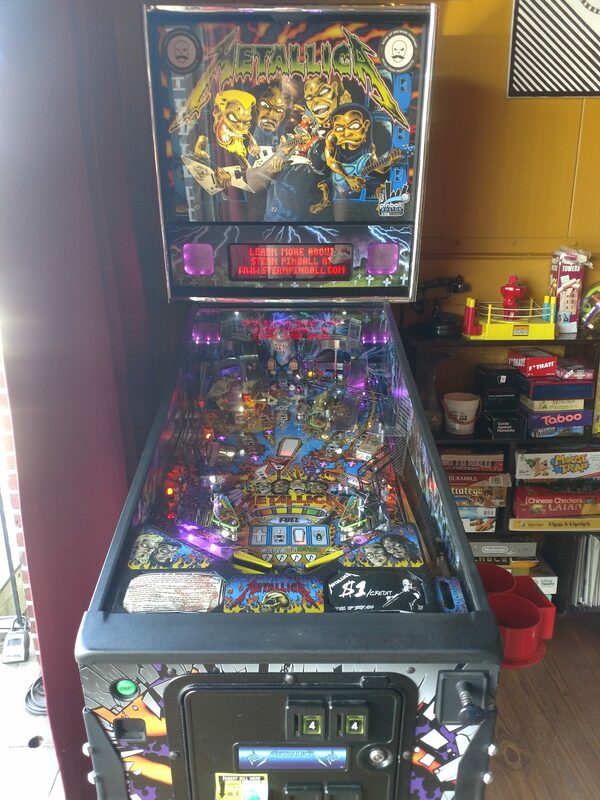 There’s Metallica pinball, a Ms. PacMan/Galaga arcade machine, and a couple of bookshelves packed full of old board games and irreverent 90s comics; a Farside collection and Tick graphic novel were two things in particular that caught my eye. As an added bonus, the bartenders were all super friendly and their playlists offered up a steady supply of classic metal that perfectly matched the decor. As for the beer they had maybe a dozen or so brews on tap, so I decided early on to resign myself to not being able to try them all. 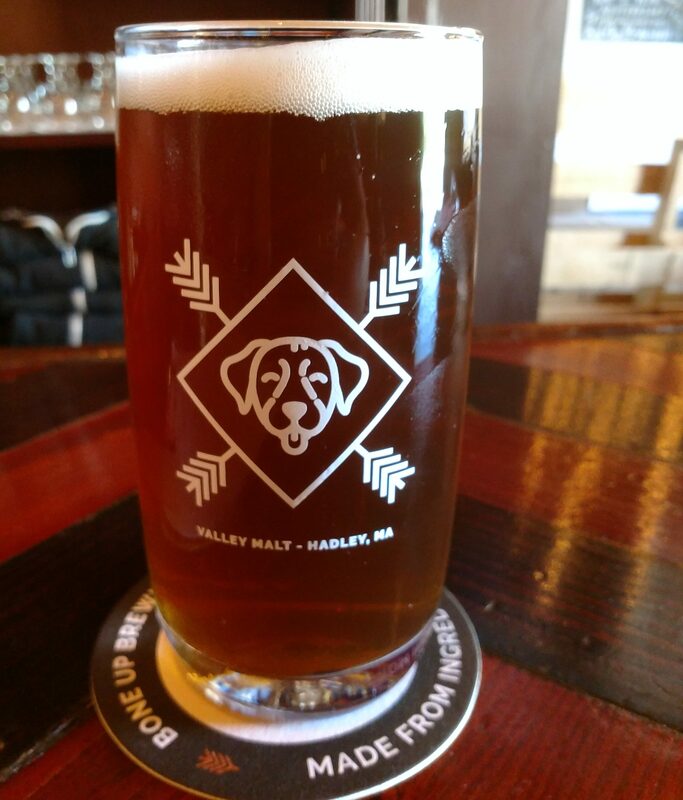 With that in mind, I started my day off with a 4.8% Kentucky Common named Mr. Buttons in memory of a dog owned by one of the folks over at Valley Malt. It wound up being an excellent brew to start my day off with after an extremely hot walk over from the train. It drank nice and easy with a sweet malt base and lingering hints of rye and very lightly toasted malt. I paid a couple of extra dollars for the glass, because, well, I liked it and the proceeds from the sale went to benefit local shelter dogs. Beer number two was another full pour and also my strongest offering of the day, a 7.4% double IPA named 4 Star Smoothie that was hopped with a “newish” variety called CrysCade. It poured a glowing yellow/amber body and had a nice creamy orange taste upfront and a mild, hazy grapefruit bitterness lurking in the background with some light malt. The finish was smooth with slight peppery notes and a lingering fruity aftertaste. A very nice take on the style. Finally, in an effort to make the most of my time at the brewery, I decided to end my visit with a flight. In an effort to be somewhat responsible about that decision, I filled said flight with some of the lightest offerings available. Their flights are served up in muffin trays, cost $9, and come with four samples of whatever is on draft plus a complimentary snack from the dollar wall (I chose Cheez-Its). I began with Wasted Life, a 6.4% IPA. A nice blend of dank hops atop a fruity, bubblegum sweet base I’d definitely go back for a full pour of this. Brew number two was Azacca, a blonde ale checking in at 4.4% and featuring a sweet honey malt base and refreshing blend of fruits. Next I went with Key Lime, which was very aptly named and awesomely refreshing. Nice and light at only 4.7%, this was another great beer for a hot day. I gave this one a write-up when it first came out so you can check out my full notes here. Closing out my day was Hillcrest, a 4.8% session brown ale with smooth grainy notes. All in all, I had an excellent visit to the Bone Up Brewing Company taproom. I really enjoyed the laid-back atmosphere and had a great time having some drinks while playing a few classic arcade in the process. Make sure you give this place a visit if you are in the area! I realized that other day that it’s been a while since I last checked in here. Some of that’s been life and some it has been on account of taking a much-needed family vacation last week. I took a long weekend before the July 4th holiday and spent the time celebrating my son’s second birthday in style by heading up the White Mountains region of New Hampshire. 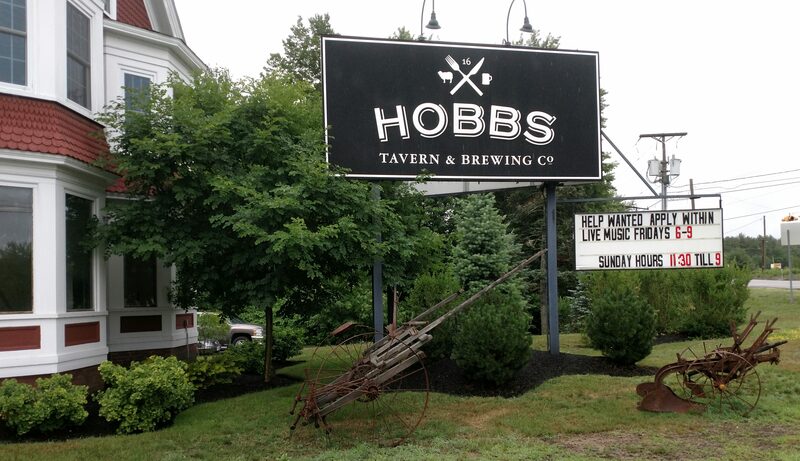 On the way there we all made a stop for lunch at the Hobbs Tavern and Brewing Company in West Ossipee, NH. The facility and restaurant are housed in a large red farmhouse conveniently located right on Route 16. The inside is quite spacious with a beautiful wooden interior and plenty of tables for dining. I won’t go into detail on the food, but I will say that my wife and in were both quite pleased with out meals. Her Tavern Salad served with a blueberry mead vinaigrette earned high marks and I have nothing but good things to say about the 36 Hour Brisket Sandwich as well. 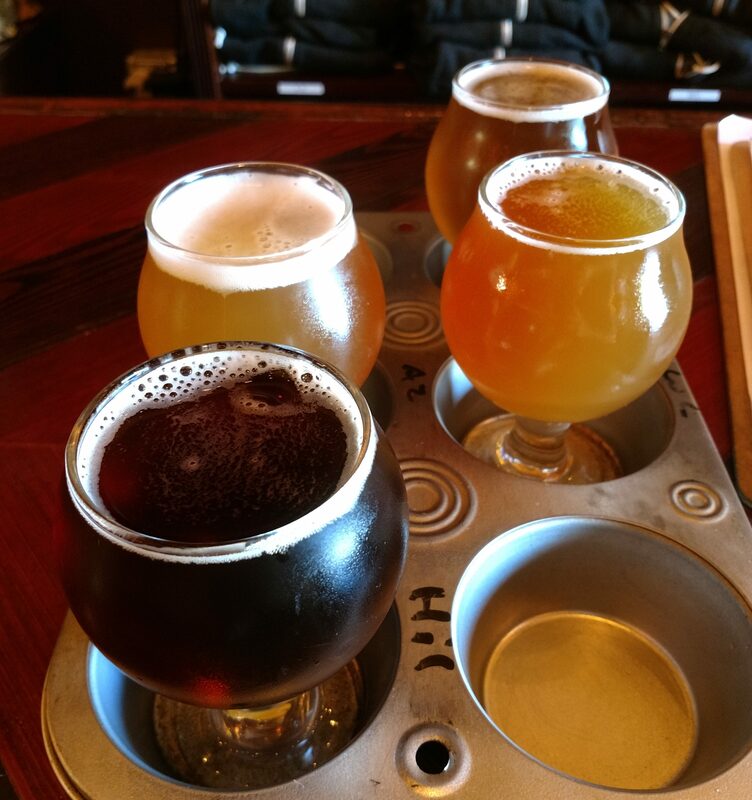 As for my beverages, I went with a flight to experience as much of their wares as possible. Their flights let you sample any five beers from the current draft lineup, with each taster priced individually depending on the brew (everything I saw was between $1.50 and $2.50). I’ll go through my choices from right to left since that’s the order I drank them in (because why wouldn’t I?). I started out on the lighter side of things with River Drifter Pils, a 5.1% Pilsner with some nice notes of honey. I rather enjoyed this one and am happy to say that it helped get my unofficial summer of pilsners back on track. Up next was Easy Bean, a sessionable 3.5% nitro stout brewed with coffee and lactose. I was a pretty big fan of this one as well and really liked how its fresh coffee taste combined with the silky smooth body of a nitro stout. At the halfway mark I came upon Ten State Stout. Checking in at 5.0%, I thought this was a perfectly fine oatmeal stout; not particularly notable, but good nonetheless. My penultimate brew was a double IPA named Pitch a Tent. It was the largest beer of my day at 8.0% and in the style of a “West Coast” IPA with a mostly tropical profile upfront and a dry, grass and pine bitterness on the finish. This was another one I thought was fine, but didn’t really stand out for me. My last beer of the day also happened to have one of the more amusing names I’ve come across lately – That’s Not a Knife. As an error on my part, I at first thought of this as a Simpsons reference, but apparently Crocodile Dundee (which I’ve never seen!) was the true inspiration. Anyway, this 4.2% Pale Ale was brewed in collaboration with Henniker Brewing Company and featured Australian grown Galaxy and Summer hops. Tropical fruits burst out of this, complimented by a base of bready malts and a sweet, hoppy bitterness. It certainly closed out my meal out on a high note! All things considered this was a very nice little pit stop for us. Great ambiance, excellent food, and good beer made this place a winner in my book. I highly recommend given it a look if you’re in the area. Last weekend our quest for family fun brought us to Lookout Farm, located just about an hour southwest of BeerRantsandBooks HQ in South Natick, MA. This trip did not disappoint; the spacious farm was beautiful to behold and with two play areas and a train to transport visitors around the premises there was plenty to keep our toddler well entertained. That alone would have made for a pretty good day, but the farm also had another treat in store for us: a taproom serving food and a variety of farm brewed beer and cider. Talk about something for everyone! I decided to go with a beer flight to (responsibly) get as much of a sense of what they had to offer as possible. Going in the order of right to left, the sampler offered a nice mix of styles and flavors, starting with Super Yellow Pilsner. Checking in at 5.6% it had a nice clean, light taste and was rather refreshing after a day out in the sun. Up next was Natick Nectar, a smooth, funky, and slightly sweet 4.7% witbier brewed with peaches. Not sure the funk quite fit, but it wasn’t bad either and had a nice fruitiness. Beer number three was a 6.4% hoppy red ale named Big Red Barn Ale. I consider myself an aficionado of this style and was quite pleased by this offering. Its sweet caramel malt base and fresh, hazy resinous hop presence hit all the right boxes for me. Closing things out was Harvest Day, a 6.7% IPA featuring a grassy/piney hop bitterness atop a slightly sweet light malt base. The glass behind the flight contains their Hop Up cider, which got an enthusiastic thumbs up from my wife. Although I am going to limit my reviews here to the beer, I do want to put in a quick plug for the food The fried Brussels sprouts and french fries we had were both fantastic, and they served up a pretty good pretzel and cheese and sausage plate as well. Also of note, food allergies are a concern in my family and the bartender serving us was very helpful and accommodating in helping us make our decisions. All in all we had a great time here and will definitely be coming back during the months ahead. There were a couple of brews on tap that I did not get a chance to try this, a stout and a triple, so for sure I’ll be checking those out if they’re still around next time. My wife and I absolutely love the fall season, so we took advantage of a beautiful weekend and took an impromptu day trip up to Ipswich, MA. After paying a visit to Russell Orchards for some apple picking and fun on the farm, we ventured downtown for dinner and a few beverages. 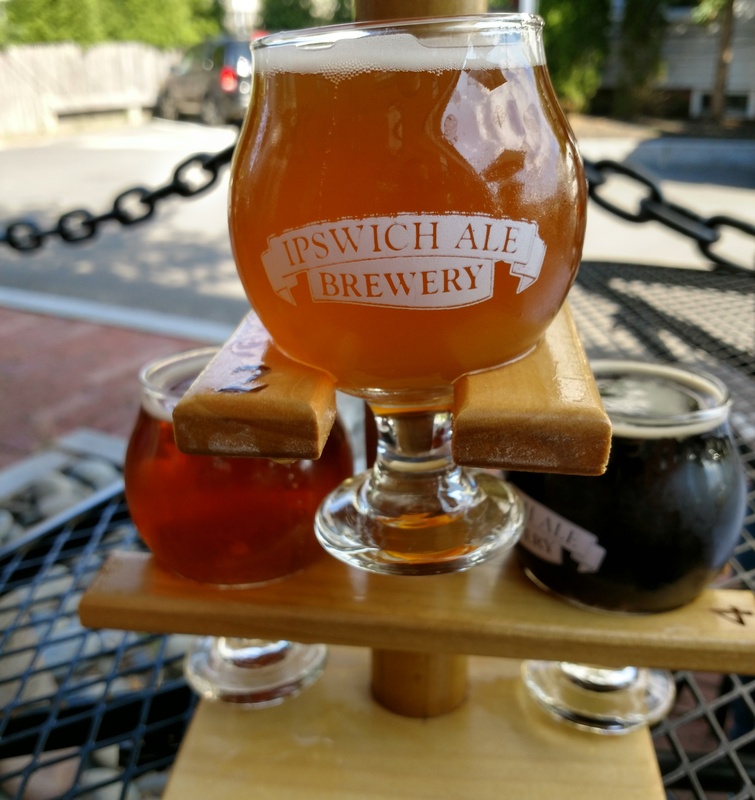 Built as an addition to the Ipswich Ale Brewery in early 2016, the Ipswich Brewer’s Table offers up plenty of good food and a wide variety of the beer made right next door. Since it was such a nice day, we went with the outdoor seating at one of the several tables set up outside. Being located on the edge of an industrial area, it wasn’t exactly the most scenic of spots but the street we were on did have it’s own quiet charm nestled in between the brewery complex and some residential units. For a quick note about the food, both my wife and I loved our meals; the pulled pork sandwich in particular earning my seal of approval. Our waitress was fantastic and very attentive and accommodating of our food allergy concerns. Now for the beer. 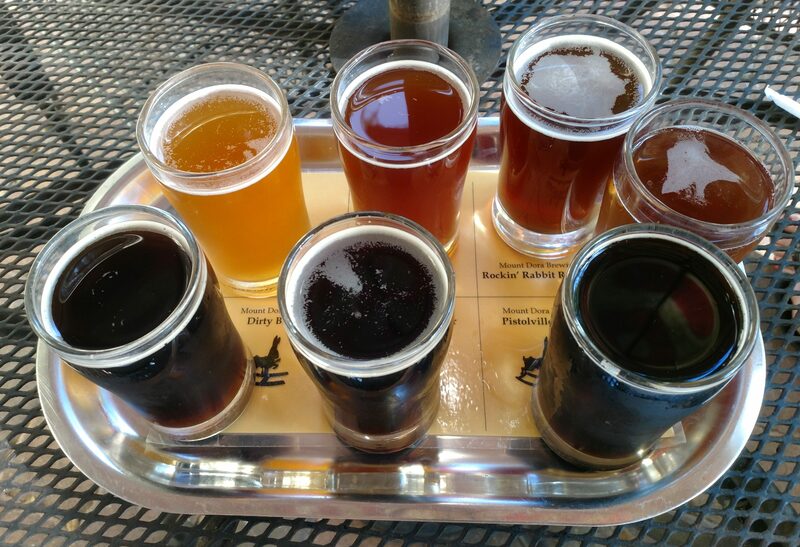 Seeing how we were out to celebrate the fall weather, I started my visit off with the Fall Flight featuring four of the brewery’s seasonal offerings. Going down the list, I started out with Chucktoberfest, a solid 6.1% marzen with the malty, slightly sweet, and bready profile I was expecting from the style. Beer number two was the Trailblazer Pale Ale which was nice and light at 4.5% with a mix of mild lemon and citrus fruitiness and bitterness. The third brew was another pale ale named Hop Harvest. This one came in at 7.0% and poured a bit darker amber color than the previous. It had a nice mix of citrus sweetness blended with grapefruit bitterness. A sweet malt backing helped make this my favorite of the flight. The final beer in the sampler was the Pumpkin Porter. Super rich and smooth to drink, the taste blended roasted malts with pumpkin spices. It wasn’t bad, but admittedly not really my thing. Full disclosure, I do have something of a history with pumpkin beers to keep in mind and also generally prefer to wait until October before trying any out. If you’re into pumpkin beer, check this one out though. It was definitely better than a lot of the others I’ve tried. The main event for me was a beer that I had read some good things about but had yet to come across; the Route 1A Double IPA. Coming at 8.2%, it poured a nice amber color with a thin slightly off-white layer of foam up top. Taste-wise it featured a nice sweet caramel-like malt base underneath a top layer of moderate citrus sweetness, grapefruit, and resinous pine sap bitterness. Mouthfeel was on point for the style with a steady amount of carbonation. I was big fan of this and will be sure to keep my eye for this in the future. We all had an excellent time here and I would certainly recommend this as a place to check out. Good food, good beer, and outdoor seating. What more could you want? 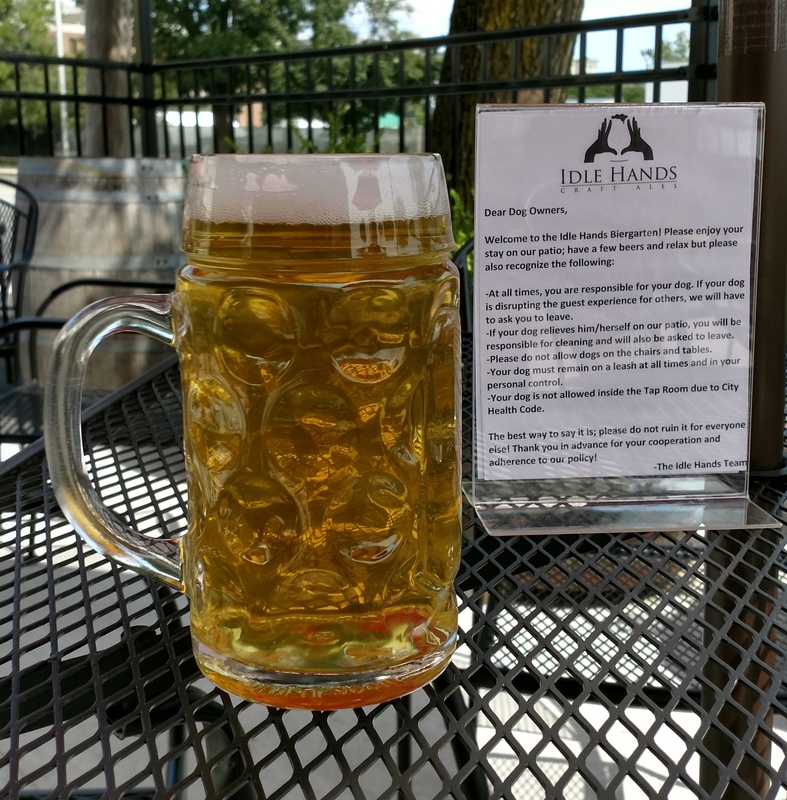 This past weekend I set out on an adventure that just so happened to take me past the Idles Hands taproom. It also just so happened to be way too nice a day not to investigate their new outdoor patio seating. Description: Unknown to me at the time, this pilsner was brewed in collaboration with Ardent Craft Ales. Some more details and specs can be found here on the Idle Hands website. A hefty Stein came at a price of $7.50. Appearance: Clear pale/light yellow body underneath about a finger and a half of light, fluffy white foam. Smell: Faint sweetness and light malts. Taste: Slightly sweet upfront with a subtle citrus and tropical fruit medley. Around mid sip a light, crackery malt base started to poke through and was joined on the finish by a mild grassy bitterness. Very light overall and super drinkable, the opening sweetness and crisp, clean ending blended together quite nicely. 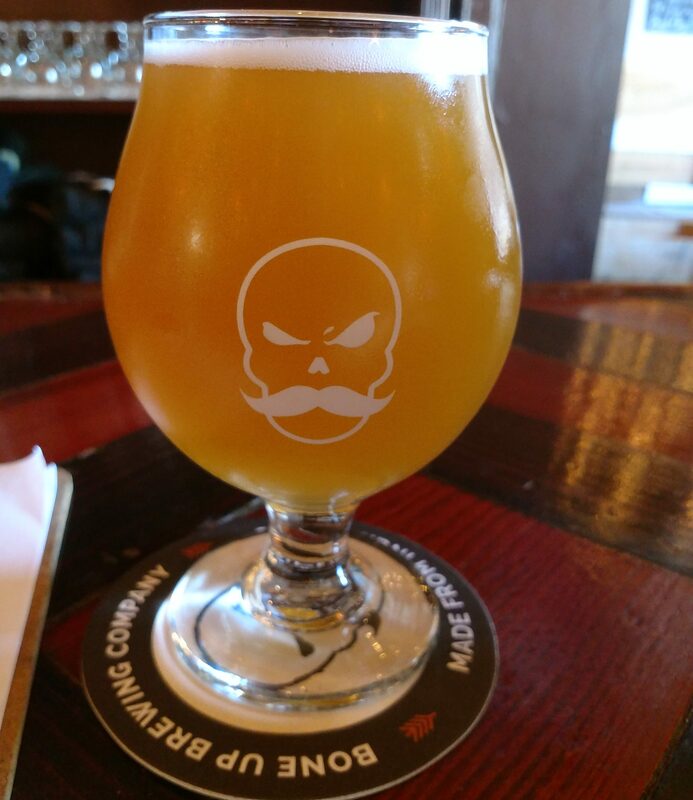 Mouthfeel: On the lighter side of medium bodied with a moderate amount of carbonation. Hype: Not so much. This brewery doesn’t really seem to buy into the hype machine and pilsners aren’t exactly a style people go crazy lining up for. Overall: In all honesty, I didn’t order this brew expecting to be blown away. I was really just looking for something low in ABV that sounded refreshing and picked this off the list. Couldn’t have been happier that I did! This beer impressed right from the start. Not only did it deliver exactly what I was looking for, but it also pleasantly surprised me with the mild sweetness and bitterness. Perhaps not your traditional pilsner (indeed they list it as American Post-Modern Pilsner), it was nonetheless an enjoyable take on the style. Do yourself a favor a grab a pint of this while you can. Last weekend the family took a trip up to Haverhill, MA for an event at Winnekenni Castle. On the way home we were in the mood for a snack and stopped off at the Tap Brewing Company’s restaurant/pub. 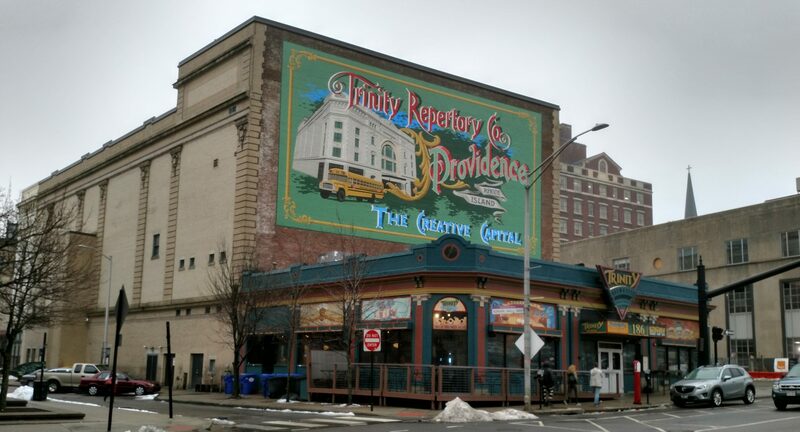 The pub is located in downtown Haverhill, an area with the look and feel of an old industrial center on the verge of blossoming into an up-and-coming neighborhood. The facility itself is deceptively large, especially when entered from Washington Street where at first glance it seems to comprise entirely of a few small tables out front and a bar room immediately inside. 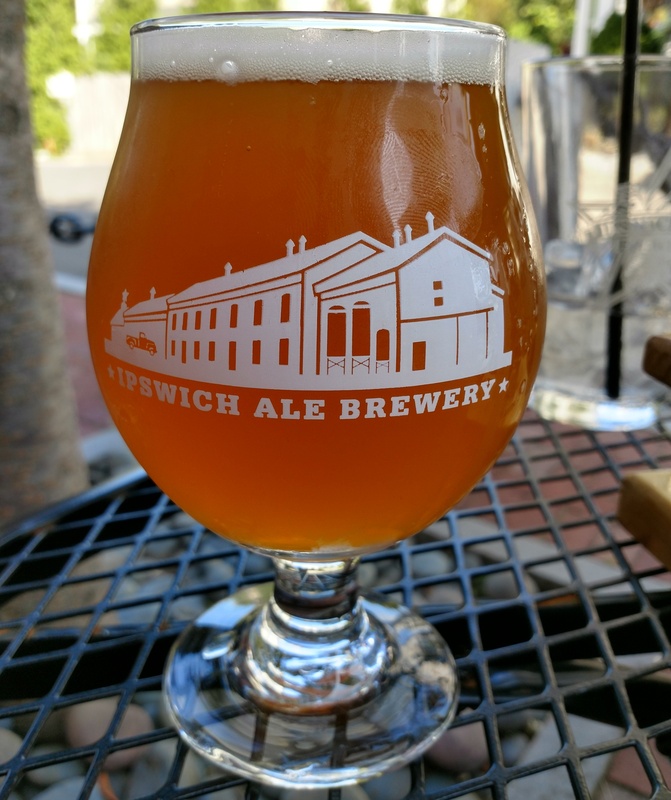 There is, however, plenty of additional seating out back on a large patio overlooking the Merrimack River and in another dining room downstairs where the brewing facilities are also located. Upon taking our seats outside, I got to work deciding upon a flight. There were about a dozen beers pouring that day in a variety of styles. After mentally culling the list down to roughly half that number, I used the beer names to make my final choices. First up was Invisible Creatures, a 4.7% pale ale. It poured a cloudy yellow body and struck a nice balance between light bready malts and grapefruit bitterness. Very mild and summery tasting. Beer number two was called Skydog. Listed as a 5.25% American dark lager, it had brownish, cola colored body and combined subtle sweetness with mild roasted malts. Up next was another pale ale, this one named Home Run. A bit bigger than the previous one at 5.6%, this was also my favorite of the two. Pouring a nice amber color, it showcased that caramel malt/piney hop flavor profile I love so much. Closing out the flight was Intergalactic Acid, a 3.0% Berliner weisse that was the star of the day. Smelling vaguely sweet and floral, it packed a hugely satisfying fruity, tart, and slightly funky taste. Based on this initial sampling I would have happily done another flight had we not been traveling with a baby. Since we were, this is where I ended my day. Definitely check this place out if you find yourself in the area. In my sampling the beers ranged from good to great and we all really enjoyed sitting outside.